Great Breakfast!!! With private beach! 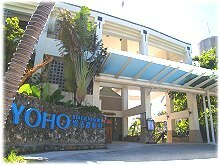 Spend two night in yoho beach with my family. The accommodation and amenities is well above average in kuting area. I may visit again if I got big discount. 設施有點老舊,但還ok! 第一次住就被升等！還不錯喔 服務人員服務ok 精緻晚餐還不錯! 早餐價位不符正比. 這次住悠活單車館覺得就一般~ 不如預期的好~有點失望! 比較推薦兒童館跟悠活旅館~ 覺得房間的設計及備品感覺比較棒! 早餐可用餐時間很長~超棒~ 菜色內容也有很多選擇~ 超推薦訂房一定要加早餐! 天主教衛道高級中學& 弘文高級中學 07年高三戊 畢業旅行 墾丁七天六夜 玩得很愉快 !! 酒店 -- 五星級 服務很親切 !!! 價格 很"公道 " 18歲難忘的回憶 !! !